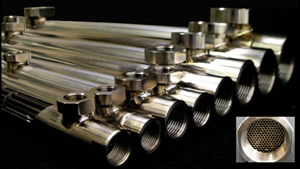 Strengths of Tokyo Titanium are extra-fine tube manufacturing, precise welding technology and accumulating know-how. 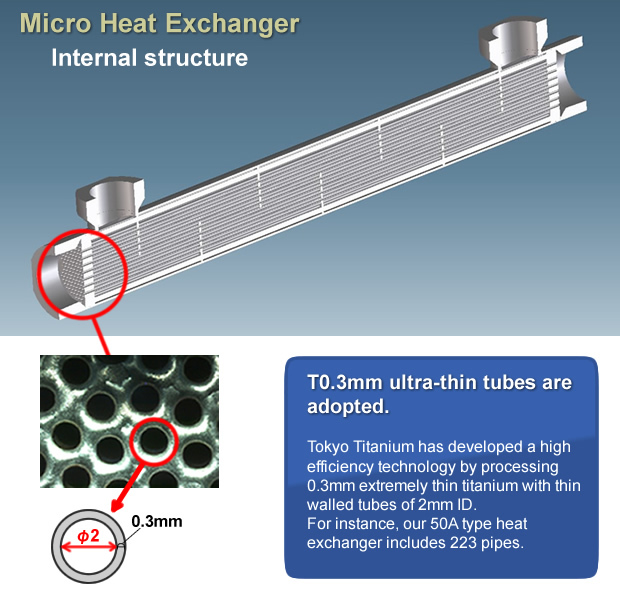 Tokyo Titanium has succeeded in developing the Ti micro shell and tube heat exchanger with 2mm ID and t0.3mm, which is generally difficult to weld by TIG welding. Compared to conventional heat exchangers, the effectiveness of our Ti heat exchanger is excellent and less installation space is required. Capability of manufacturing an ultrafine titanium pipe without changing the properties of the inner hole is necessary. Based on such technology, Tokyo Titanium has advanced development on various products.